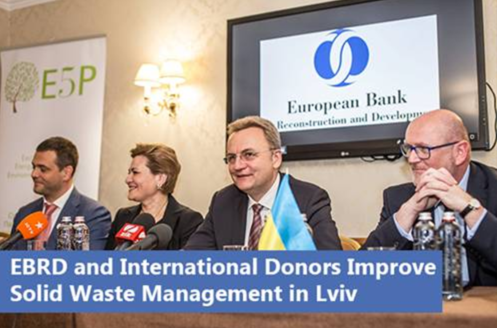 The western Ukrainian municipality of Lviv will receive a financing package of up to 35 million euro arranged by the European Bank for Reconstruction and Development (EBRD) to address long-standing solid waste management issues. In doing so, it becomes the first Ukrainian city to join the Bank’s Green Cities Framework. This framework offers a comprehensive business model for green urban development, combining strategic planning with investments and associated technical assistance. As such, Lviv will over the next twelve months be implementing a Green City Action Plan (GCAP) in order to implement green municipal investments and necessary policy reforms. A 13-year municipally guaranteed loan of 20 million euro from the EBRD will be complemented by an investment grant of up to ten million euro from the Eastern Europe Energy Efficiency and Environment Partnership (E5P), to which the European Union (EU) is the largest contributor, and a five million euro concessional loan from the Climate Investment Funds’ Clean Technology Fund (CTF). The funds will be used to support the rehabilitation of the Hrybovychi landfill and the construction of a municipal solid waste mechanical biological treatment plant in Lviv, reducing greenhouse-gas emissions by approximately 141,500 tonnes of CO2 equivalent per year. The city will also adopt better recycling and waste management practices. As a UNESCO protected city with a renowned cultural heritage, Lviv has over 750,000 inhabitants and is the administrative and touristic centre of the western part of the country. The project is also the first to be implemented in the context of Ukraine’s National Solid Waste Management Strategy. Innovation District IT Park, the largest infrastructure project of Western Ukraine, was launched on 30th of June 2018. The groundbreaking ceremony was hosted by the consortium of partners: project’s initiators Lviv IT Cluster and Galereja Centre, as well as investment companies Brookfield & Partners and Horizon Capital. IT Park’s officially announced construction will cost in total 143,3 million euro, this amount is invested by several companies. Volodymyr Zhenchak, developer and investor of the project Galereja Centre says: “By 2021 we will build six 8-story buildings with a lease area of 72,000 m2. One high-rise business centre with a total area of 32,000 m2, a multifunctional centre with a variety of leisure and relaxation areas, conference rooms, and an international network hotel. However, the real value of IT Park cannot be measured with square meters. It’s a very ambitious project, and our goal is to implement it in the best possible way”.